On Thursday 30th May, Brillantmont hosted a very special evening, which took us around the world and back home, to BM. The students who went on the Habitat for Humanity trip at Easter shared their photos and videos, not only of the joy, sweat and tears of building their house in Cambodia but also their workshop with the local school-children, educating them in better hygiene practices. They also shared pictures of their heart-rending visit to the "Killing Fields." Students, parents and staff really got a sense of the tremendous impact that the trip has had on the students and hopefully, it will inspire others to join the Habitat team. From Asia, we headed to cooler climes. Graduating student Mark Temnikov gave a fascinating presentation of his recent trip to Antarctica. With his parents, he travelled by expedition ship from Ushuaia. In addition to helping bring much-needed supplies to one of the bases, Mark braved sub-zero temperatures to get out and about and encounter some of the local wildlife. The outstanding photographs he took of birds, penguins, sea lions and icy landscapes were auctioned off. A transatlantic journey brought us back to the cosy warmth of our multipurpose hall, where in a campfire style set, the vocal group sang a beautiful repertoire of songs around the theme of home. As the end of the school year approaches and some students head off for new horizons, the songs had a certain poignancy. The expressions "home is where the heart is" and "home sweet home" certainly rang true! 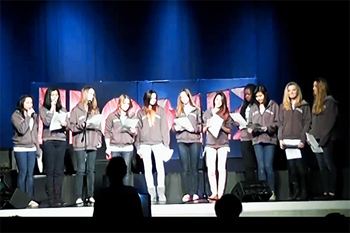 By the end of the evening, students raised an amazing CHF 1,500 for Habitat for Humanity. Habitat for Humanity and the Vocal Group are just two of the extra-curricular activities for kids available here at Brillantmont International School.